Well, Happy Thanksgiving everyone. What are we going to do here? We have invited our English classes to come over to the house tonight and enjoy some traditional or semi-traditional Thanksgiving treats. Jessica is modeling our food below. 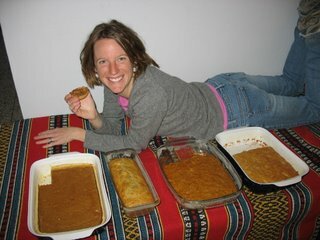 Here we can see Jessica showing off the many dishes that we have made, all of which have been significantly sampled. From left to right we have: pumpkin pie, banana bread, my tart holding a pumpkin tart, carrot cake, and apple cake. So that's about it from here. Hope you enjoy your day. Be thankful, and know that we are thankful for you (and your comments). Happy Thanksgiving to both of you! It is 7am here and we are getting ready to head "east" to be with family. We love you both as if you were our own. GIVE THANKS ALL DAY TODAY! sounds like an excellent meal. tell folks i said hi and happy "eid dyal shukran"